Most adults make many major and important financial decisions with very little support or guidance. At Quantis Wealth Management, we work with firms to help improve their employees’ financial well-being. Through our unique Financial Employee Education in the Workplace Program, we offer a streamlined process to enhance your employees’ financial lives and make them more financially efficient and productive. Participants also have the opportunity to meet with a qualified financial professional to discuss their current situation, ask specific questions, as well as receive guidance and advice to further cement their learning from our seminars. 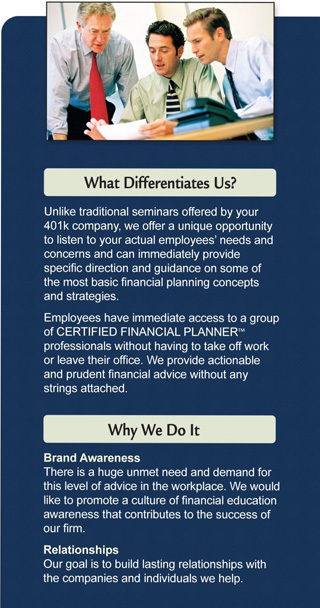 This will allow your employees to utilize the knowledge they gain from our seminars and be able to apply it to their own unique financial situation. This comprehensive approach can be a valuable educational experience. It provides a broader context to help people set realistic goals and make sound financial decisions for their families. This communication is strictly intended for individuals residing in the states of AR, AZ, CA, CO, CT, DC, DE, FL, HI, IL, KY, MA, MD, MI, MN, MT, NC, NJ, NM, NY, OH, PA, RI, SC, TN, VA, WI. No offers may be made or accepted from any resident outside these states due to various state regulations and registration requirements regarding investment products and services. Investments are not FDIC- or NCUA-insured, are not guaranteed by a bank/financial institution, and are subject to risks, including possible loss of the principal invested. Securities and advisory services offered through Commonwealth Financial Network®, Member FINRA/SIPC, a Registered Investment Adviser. Fixed insurance products and services offered through CES Insurance Agency.